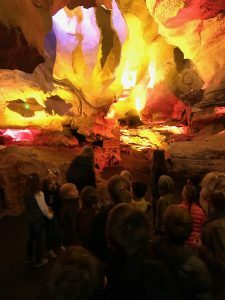 Yesterday, second grade visited Skyline Caverns as a part of their study of Geology in science class. Learning experiences beyond the classroom can often be among the most valuable experiences a student will enjoy and remember. Field trips are an integral part of our curriculum. All of our field trips have curricular significance, and there is an instructional focus for the students. Powhatan students benefit from the varied and multiple field trips throughout the year, which are intentionally planned by teachers to enrich our curriculum. Two recent examples include the fourth grade overnight field trip to and the sixth grade Survival Trip. The fourth grade spent two days on a trip to Charlottesville and Staunton, Va. Students and parents visited Monticello, The University of Virginia & The Frontier Culture Museum. The sixth grade Survival Trip provides students the opportunity to spend quality time in the outdoors and learn the self-sufficiency needed to stay in the outdoors by choice or by need. Survival Trip is cross-curricular in nature and based on their study of the book Hatchet by Gary Paulsen. Click here to learn more about that specific trip. Students benefit from these hands-on trips through the vivid experiences and the added depth in learning. In addition, field trips help students develop critical thinking skills and fosters empathy. Our Holocaust Museum trip, for example, helps students contextualize what they have been learning in the classroom through powerful, sobering, and authentic pictures, videos, and artifacts. There is great power in field trips! When students return to school, there is also a lasting significant effect. Students are better able to recall facts and information, and also to write critically about the content after hands-on field trips. The field trips at Powhatan are inherently linked to the rich classroom teaching across the curriculum – from World Language and Art, to Math and Social Studies.